Working to be the top source of dirt bike and motocross racing tips, maintenance advice, funny quotes, and articles on dirt riding things like buying a used dirt bike, how to do a wheelie, and everything else for the mentally-motarded. Well, for those of you looking for motocross quotes, I finally got around to revising the Dirt Bike Humor page. Down below you'll find funny quotes, some jokes, sayings, pictures and more about dirt bikes and motocross. I've reorganized the funny stuff I already had, and added quite a few more cool quotes and sayings. Some of these have been taken from, or added to, some funny dirt bike shirts, and mugs and such, so I've added links to those where I could. As much as possible, I'd like to give credit to whoever said these, so if I've attributed something to the wrong person, prove it and I'll fix it. Thanks! That's all the motorcycle is, a system of concepts worked out in steel. Keep your dirt bike in good repair: motorcycle boots are not comfortable for walking. A motorcycle functions entirely in accordance with the laws of reason, and a study of the art of motorcycle maintenance is really a miniature study of the art of rationality itself. People are more violently opposed to fur than leather because it's safer to harass rich women than dirt bike riders. Motorcycle racing makes heroin addiction look like a vague wish for something salty. A narrow track of dirt through the forest isn't a trail -- it's an attitude. Most of these have been passed back and forth at the track or along the trail for years. A couple are inspirational, most are just plain funny. If you can prove the original source, let me know and I'll give credit where it's due. The race goes to the swift. But sometimes none of them show up, and the rest of us have a shot at it. Regular maintenance is the key to reliability; irregular maintenance is the key to great exercise. The 3-percent rule: If you want to go faster, ride with people who are 3-percent faster than you. The other 3-percent rule: If you want to have fun, ride with people who are 3-percent slower than you. You've got to finish to win. Of course, you've got to be fast to win too, otherwise everybody would be doing it. There is no physical training regimen so strict that it can't be undermined by a rigorous program of deferred motorcycle maintenance. There are old racers and there are bold racers, but there are no old, bold racers who don't walk funny. Patience is a virtue of many racers. Unfortunately, it's also a virtue of a lot of losers. The wise racer only ticks off the people he can beat. The secret of successful race tuning is knowing when to start riding and stop tuning. You can't 2-½ a triple. At least not a second time. A man never stands so tall as when he stoops to let the air out of a competitor's tire. Never underestimate the power of good old-fashioned intimidation. Motocross is like football -- but without a bunch of guys showering together when it's done. 90% of my paycheck goes towards dirt bikes (the rest is just wasted). The more complete your on-board tool-kit, the more likely it is that all your trail riding buddies will expect you to fix everything that breaks on their bikes. A good rider can overcome marginal equipment. However, even the best equipment can't overcome a marginal rider. Ruts are like side-panel screws: just when you think you're in the right groove, you get cross-threaded. Blood in your stool is nature's way of suggesting that you rethink your spring rates. The good news is that heaven has a motocross track. The bad news is you're racing next Tuesday. I know there's money in motocross. I put it there! There are places on Earth that quads simply won't fit. Unfortunately, quad riders aren't aware of this. Gravity intensifies with the installation of new levers. You only have one chance to make a first-turn impression. Scientists call it C9 H13 NO3. You call it adrenalin. I call it my dirt bike. If you want to come in second... follow me! I never lose. I only run out of laps, gas, or time. Careful maintenance and preparation is critical to making your dirt bike is reliable enough to tow your buddy's bike back to the truck. Winning riders never have "left over" parts. Riding faster than everyone else only guarantees you'll ride alone... and I'm okay with that. Winning isn't easy... I just make it look that way. Dirt bikes are not for wimps. They are, however, quite suitable for the clinically insane. Scars – the original tattoo – invented by nature, perfected by dirt bikes. Only the guy who finished second remembers who came in second. Never spit at a competitor when you're wearing a full-face helmet. If you think riding gets the adrenalin pumping, try getting a wasp in your helmet. Companion wanted. Male motocrosser seeks caring and generous lady with her own dirt bike. Please send photo of dirt bike. In case of dirt bike injury, please reassemble as indicated. The dirtier it gets, the better it looks. No one ever wins an argument with a tree. You can't beat gravity in a fair fight, but sometimes you can sneak up behind it and punch it in the head. I plan to leave this world the same way I came in – screaming and covered in blood. If people focused on the important things in life, there'd be a shortage of dirt bikes. Gravity is for the weak. Real motorcycles don't have gauges. Resist the path of least resistance. If you come between me and the finish line, there will be blood. And dirt bikes don't bleed. Silly boys, dirt bikes are for girls. The shortest distance between two points is for people who can't ride. Wrecks perfectly good dirt bikes. My dirt bike is a gift from my children, purchased with money they will not inherit. You don't stop riding when you get old. You get old when you stop riding. All I remember is dirt sky dirt sky dirt sky ambulance. You will never see dirt bikes in the psychiatrist's parking lot. Failure IS an option – a bone-breaking, flesh-tearing, excruciatingly painful option. Know your limits... exceed them often. I live with fear every day. But on weekends I leave her at home and go ride my dirt bike. I used to crash a lot. I still do... but I used to too. Full Throttle – solves the problem or ends the suspense. Full Throttle – the ultimate solution. When life throws you a curve... lean into it, pick your line, and keep your weight on the outside peg. I'd rather be a rider for a minute, than a spectator for a lifetime. Whaddya mean ride it “like” I stole it? Apparently this is NOT my lucky shirt. Only makes sense when you see the shirt. I want a dirt bike like mommy's. If it has two wheels and an engine, I don't care who built it, just let me ride it. Happiness is finding you have another gear. Happiness is finding you still have more throttle. If you love your dirt bike and let it go... and it comes back... you're in the middle of a crash. Riding is living. Everything else is just waiting. Spas would charge a fortune for all the mud I've had on my face. If she changes her oil more than she changes her mind – marry her! The most dangerous part of a dirt bike is the nut that connects the handlebars to the seat. Dirt bike rider color verification system. Red Neck. Blue jeans. Is your mom here today? Or are you just riding her dirt bike? Dirt bikes don't leak oil, they mark their territory. The best alarm clock is a 2-stroke starting at dawn. Helmet not wore when go ride, and no damaging so far brain yet! I ride a bullet... a two-wheeled, multiple-explosion powered machine with enough moving parts to remove entire fingers and surfaces hot enough to cook flesh. It propels me at neck-breaking, bone-snapping, flesh-shredding, speeds over and through obstacles I can see only as blurs. It's a sport that kills the careless, maims the best, and spits at the concept of mercy. Now what were you saying about your new golf shoes? What do you call a dirt bike rider who doesn't wear a helmet? An organ donor. If you don't ride in the dirt, you don't ride. Catching a yellow-jacket in your jersey halfway through a double can double your vocabulary. Only a dirt biker knows why a dog sticks his head out of a car window. Eat dirt and bleed gasoline. Don't argue with a tree. Life is not a journey with the goal of arriving quietly and safely in one pristine piece... but a chance to twist the throttle until it sticks full open... to leap over, slide under, or hammer through obstacles... to look fear in the eye and backhand it in the head... to skid, slip, or stumble across the finish line, out of gas, leaking oil and blood... covered in dirt, and free from regrets. I aren't stupid... I are a dirt biker! Two wheels, one engine, no limits. My dirt bike kid can whip your honor student. Dirt bike maintenance is as much art as it is science. Do not ignore fear – outride it. I ride way too hard to worry about cholesterol. 1. For no reason whatsoever your bike would crash twice a day. 2. Every time you wanted to ride a different track or a new trail, you’d have to buy a new bike. 3. Occasionally your bike would die for no reason, and you would accept this, restart and ride on. 4. Occasionally, something as simple as a left turn, would cause your bike to shut down and refuse to start, in which case you have to reinstall the entire engine. 5. Macintosh would make a dirt bike that was powered by the sun, reliable, five times as fast, and twice as easy to ride, but it would only run on five percent of the tracks and trails. 6. You wouldn’t be able to race more than one bike on the same track unless you bought "BikeXP", "BikeNT", or “Bike 7”. 7. The bike would say "Are you sure?" before applying the brakes. 8. For no reason whatsoever, your bike would sometimes refuse to run until you grabbed the plug wire, stuck your finger in the exhaust, and used the kick start, all at the same time. 9. You would be required to wear riding gear manufactured by the same company who built your dirt bike. Deleting this option would cause the bike's performance to drop by 50% or more. 10. Every time a manufacturer introduced a new model, buyers would have to learn to ride all over again because none of the controls would operate in the same manner as the old bike. 11. You'd press the "Start" button to shut off the engine. A dirt bike mechanic was taking a cylinder off a bike, when he was introduced to a world-famous heart surgeon. The mechanic said, "Hey Doc can I ask you a question?" The famous surgeon said “Sure!” The mechanic, wiping his hands on a rag, asked, "So Doc… I open this engine up, take valves out, fix 'em, put in new parts, and when I’m done it’ll work just like a new one. So how come you get so much more money than me, when you and I are doing basically the same work?" The surgeon looked the mechanic in the eye, smiled, and said, "Try doing it with the engine running! There's the sad story of the poor dirt bike rider who was in a terrible racing accident. When he came out from under the anesthetic, the doctor was leaning over him anxiously. "Son," he said, "I've got some good news and some bad news. "The bad news is that you were in a very serious accident, and I'm afraid we had to amputate both your feet just above the ankle." "Oh no," gasped the patient. "What's the good news?" The doctor smiled and said "The fellow in the next bed over will give you a good price for your boots." A man walks into a seedy back alley butcher shop to buy some human brain and asks "How much?" He’s told $10 a kilo for mini-bike riders… $50 a kilo fro trail riders… and $500 a kilo for motocross racers.” "Why so much for the motocrossers?" he asks. And the butcher replies "Do you know how many of them we need to get a kilo?" Did you hear about the guy who got a motorcycle for his wife? Pretty good swap don't you think? A guy at the motocross track tells you that after winning his latest race on his Suzuki dirt bike, Santa Claus came up to congratulate him, and the Easter Bunny presented him with $1000 in prize money. How do you know he's lying? Answer: No one wins a race on a Suzuki dirt bike (or fill in your least favorite dirt bike). A guy was tearing down the trail on his dirt bike but the zipper broke on his jacket, so it was letting an annoying draft in. Sitting on his dirt bike, wondering what to do, he finally decided to put the jacket on backwards, so the broken zipper was at the back. He continued to ride his dirt bike at incredible speeds, but lost control. A nearby farmer heard the crash in the bush, assessed the situation, then called 911 on his cell phone! “I found a dirt bike rider on the trail, next to the bike he crashed!” he told the operator. The emergency operator asked the farmer “Is he showing any signs of life?" "Well," the farmer explained, "he WAS... until I turned his head around the right way!" Q. Why did the chicken cross the motocross track? A. To get to the roost! Why did the dirt bike cross the road? Answer: Because they've stopped us from riding everywhere else!!! 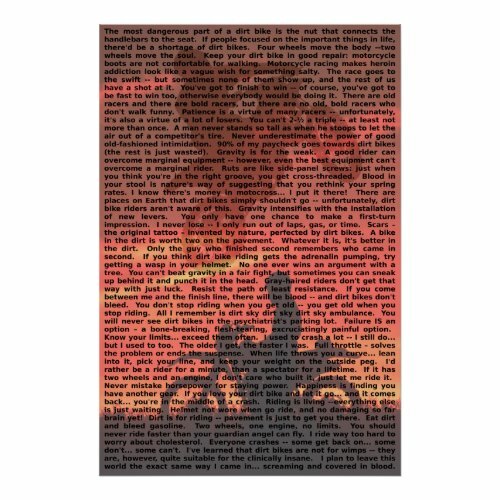 You can also find more dirt bike and motocross funny sayings, quotes, and jokes put on shirts, posters, mugs and stickers by CLICKING HERE. or mentioning the link in forums. Thanks!